INDICATIONS Science Plan* Feline Oral Care Adult with Chicken is formulated to help reduce the accumulation of dental plaque, stain and tartar (calculus), and reduce oral malodour, in adult cats (from maturity), in addition to meeting their nutritional requirements. Science Plan Feline Oral Care Adult is designed to allow a tooth to penetrate each piece of food (kibble) before the kibble splits. The fibres in the kibble are non-randomly aligned to clean the surface of the tooth as they come into contact with it; the fibres wipe the accumulation of plaque, stain and tartar from the tooth's surface. By reducing plaque accumulation, Science Plan Feline Oral Care Adult may help to control bad breath. Science Plan Feline Oral Care Adult with Chicken also contains a Superior Antioxidant Formula to reduce oxidative cell damage. NOT RECOMMENDED FOR 1. Kittens. 2. Pregnant or lactating queens. During pregnancy or lactation queens should be switched to Science Plan Kitten. 3. Cats with severe periodontal disease. PACKAGING Bags : 300 g, 2 kg and 5 kg 1, 2, 3 For footnotes see page following Formula Types IMPORTANT POINTS: SCIENCE PLAN FELINE ORAL CARE ADULT * has been proved to be effective when used on clean teeth; it will have less effect on unclean teeth, * should be used as the sole maintenance food for maximum effect, * should not be moistened before feeding; adding water prevents an effective cleaning action, * contains no mineral abrasives or active chemicals. In addition to feeding Science Plan Feline Oral Care Adult the use of other home care methods to reduce the accumulation of plaque and calculus are recommended wherever possible - in particular, regular brushing of the cat's teeth. The acidic urinary pH produced, and the controlled mineral content, help to avoid the onset of clinical signs associated with feline lower urinary tract disease (FLUTD). FEEDING GUIDE Many factors such as environmental conditions, activity level, stage of life and individual variation (temperament, stress) can affect the amount of food needed. Adult cats should be fed only sufficient food to maintain their ideal body weight, in one or two meals per day. 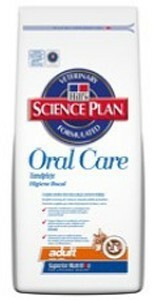 Science Plan Feline Oral Care Adult should not be supplemented as such additions may upset the nutritional balance. Fresh water should be available at all times. The following feeding ranges are intended as a starting point only and should be adjusted as required to maintain optimal body weight.